When ever I hear "Hickory Farms" I think of Christmas. How about you? As a kid, I recall seeing their kiosk every year, no matter what! We always stopped and got samples and planned out Christmas purchases. Growing OLDER, we've done the same with with our kids. It seems like everyone has a favorite. The summer sausage and gouda cheese are my personal favorites. I just stopped over at the Hickory Farms website to see when they started their business. Do you have a guess? Well I guessed 1960s but I was wrong! Did you know that they have been around since 1951? That explains why I saw them as a kid and so did the adults while I was growing up. My favorite gift box is their Party Planner Gift Box. Besides being my favorite they also offer a special with this gift box. With every one sold this year, they will donate $5 to Share Our Strength's No Kid Hungry Campaign. Isn't that awesome?? -Our Signature Beef Summer Sausage 7 oz. -Italian Style Beef Summer Sausage 5 oz. -Turkey Summer Sausage 5 oz. -Smoked Cheddar Blend 4 oz. -Mission Jack Blend 4 oz. -Creamy Swiss Blend 4 oz. -Sesame, Caraway & Sea Salt Crackers 1.5 oz. -Sweet Hot Mustard 2.25 oz. This is a favorite because of the summer sausages and yummy cheeses. It is a perfect amount for a family of 5 to enjoy or share with guest. Do you have a favorite? Do you go to the mall during the holidays to purchase Hickory Farms or do you order online? Honestly, I have no clue how long Hickory Farms have been online but this is the first year I have been to their website. They are committed to delivering the finest quality products with the freshest quality products so they guarantee your order to arrive in 3 business days or less at a flat rate of $3 all season long! That is an awesome deal on shipping. 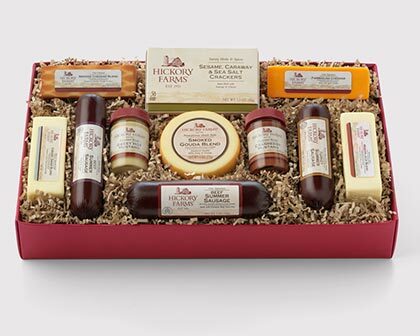 Check out Hickory Farms for your Holiday Shopping! You still have time to order online for Christmas or stop over at your local mall and pick up your favorites! I wrote this review while participating in a campaign by Mom Central Consulting on behalf of Hickory Farms and received a product sample to facilitate my review.